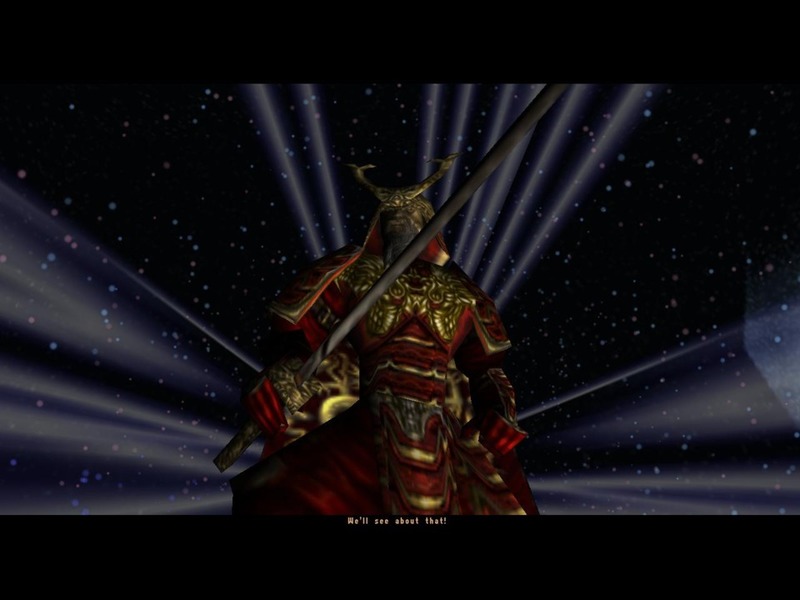 Daikatana is mediocre at its very best. There is simply no better way to put it. The level design is uninspired. The sounds are mostly weak and inappropriate. The flow of the game is choppy. The texture work is busy and looks as though entirely too much detail was crammed into resolutions far too small. For a good indicator of how the entire game plays out, look no further than the very first level. It stands out as an example of almost everything wrong with this game. It takes place in a futuristic swamp, not exactly the most exciting place ever. It is painted in primarily two colors; green and gray. The first enemies you fight are (and I'm not joking) robotic mosquitoes, robotic frogs, and robotic alligators. They all behave in the same manner; hop, fly, or crawl directly at you and attempt to make a melee attack. Your first weapon is the ion blaster; an ugly green and gray pistol that looks like it's a bundle of tubes and wires all taped together. Shots from the ion blaster ricochet off of walls and explode in water for no particular purpose. Since you spend some time in the water because you are in a swamp, it is quite a surprise to be burned by your own weapon when you attempt to fight something there. You are left to fight alligators and frogs in water with your fists. There is one path through the level from beginning to end and it is not particularly interesting or exciting. This tepid start is how the entire game plays out. Off to a great start here. The whole first episode looks like this. Early in the game you are cursed with two AI companions. Had these companions any semblance of intelligence, they may have been useful. As they stand, they are walking liabilities. They get stuck in terrain, they get stuck in doors, they fall way behind so that when you are trying to exit a level, you waste time waiting on them to catch up. They can wield weapons but since they are often far behind you, they either do not get to the firefight in time to contribute in any meaningful capacity, or they end up shooting you in the back. Babysitting them is a miserable experience. Is that supposed to be a minotaur? There is an experience point system in which you can level up your amount of damage per attack, speed of fire, speed of movement, jumping ability, and total health. Of these, the only one of any real use is increasing jumping ability. It is the only one that has any tangible benefits as it allows you to access some secret areas that you would not otherwise be able to reach. If you use the Daikatana, it takes your experience points to level itself up. 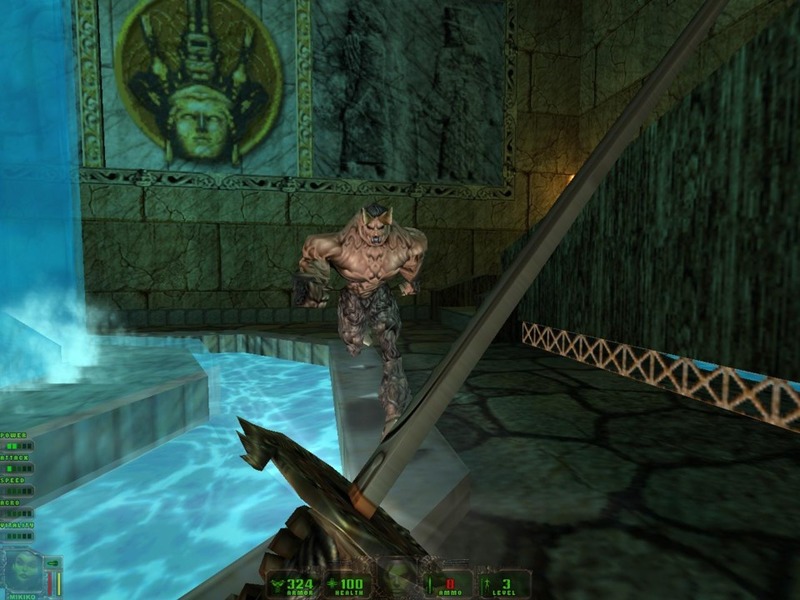 Increasing the level of the Daikatana is not really useful. It attacks faster and does more damage, but it begins to glow and spark and these effects end up taking up more screen real estate than they're worth. 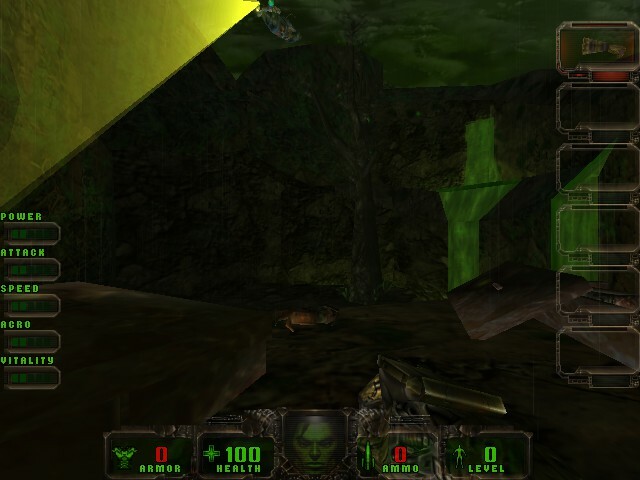 The Daikatana is useless in any ranged fight and most of the enemies in the game are melee focused, so you can put yourself at a tactical advantage by using whatever your period specific pistol is and leaving the Daikatana alone. As I described the ion blaster, so many of the other weapons in the game tend to bite you just as often as they do your enemies. The C4 launcher in the first episode is absolutely crippling to yourself more than Mishima's forces. It fires sticky proximity mines that explode in a large radius if anything comes near them, including yourself and other prox mines. Since enemies are often too dumb to follow you once you're out of sight, it is impossible to use this weapon to set any traps and it becomes a dangerously unhelpful grenade launcher. In the second episode, you get the hammer of Hades. It does healthy amounts of damage when charged, but places that damage right below your feet so you feel its power also. It'll even nuke your AI sidekicks if they get too close, which send you straight to the game over screen. The weapons in episode three are not particularly good or bad, and, in a surprising turn, the guns in episode four are actually fun to use. Episode four, however, contains one of the most personally dangerous weapons in the entire game; the metamaser. It is a thrown proximity turret that shoots out lasers at anything that comes near it, including you! However, its range is so great, and there are basically no encounters with anything more than one or two enemies at a time, and it explodes violently after a short period of time. It is far more dangerous than useful. The writing is worse than most video games, which is saying a lot. The level design can only be described as painful. As in the first level, there is typically only one path and it is rarely an interesting one. Platforming abounds and it is about as fun as pulling teeth. In episode two, there is an inordinately large area through which five runes are hidden. The player is rarely pointed in the direction of each rune and it becomes a long and boring game of hide and seek. While most levels took me only twenty minutes at most to complete, I spent over an hour on this area alone, and that does not include time lost due to deaths. At the end of episode four, there is a series of instant death platforming sections that serve only to drive the player insane. It is unfathomable to believe that someone at some point in time thought that these areas were a good idea, or even fun. 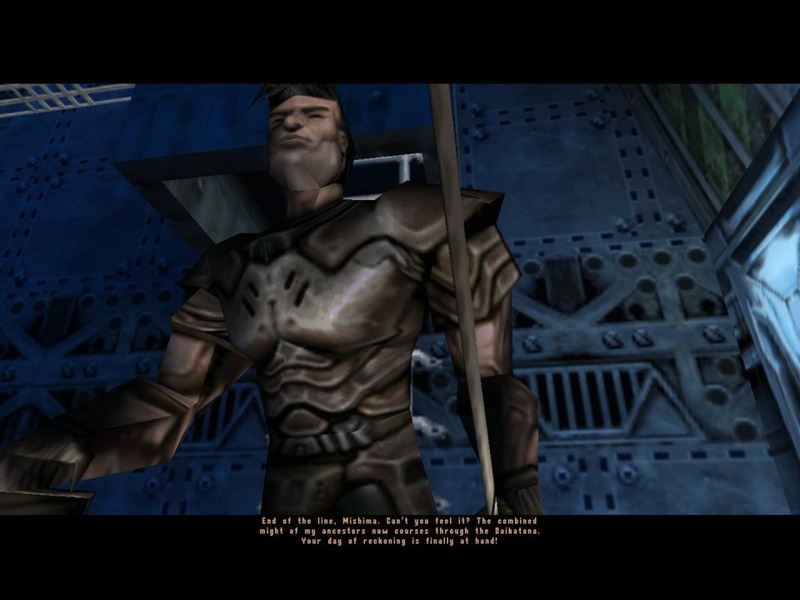 Story in this game comes only through long and boring cutscenes. Even though you carry two AI companions with you through most of the game, they rarely speak to each other or contribute anything to say about what is going on in the game. All meaningful dialog is contained within cutscenes that run too long. Thankfully they are skippable at any time. If you skip all of the cutscenes, you miss gold like this. 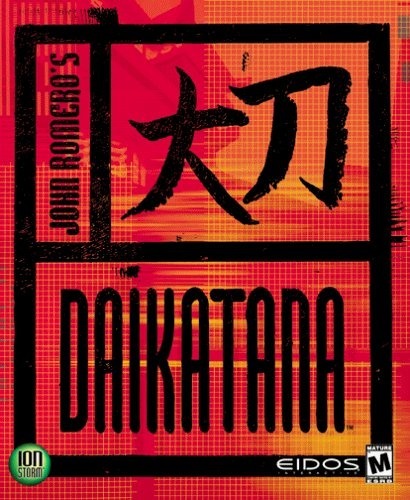 There is no avoiding it; Daikatana was not a good game when it was released, and it does not get better with age. If you are feeling nostalgic, as I was, watch a playthrough on Youtube. Do not play it. This game is far more trouble than it is worth. Bonuses: +1 there's a lot to play!